The world is filled with ways to communicate. We spend hours using the phone, email, IM and social networks. But nothing makes us feel closer than seeing our friends and family face-to-face. 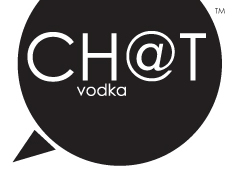 We created Ch@t Vodka to bring people together. To talk instead of type. Laugh out loud without using emoticons. And share our lives over a round of great drinks. Life is moving faster than ever. Sometimes it's nice to slow down and spend time with the people you care about. Ch@t is a conversation starter. Everything about us is new, innovative and bold – from the sleek black bottle to the amazing way we make our vodka silky smooth. We're more than just another drink. Ch@t is the next generation of vodka.